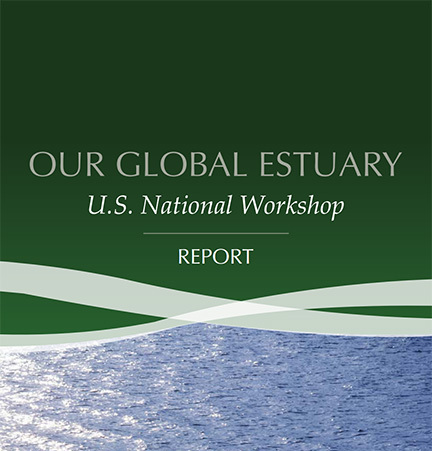 A report has recently been released by the Our Global Estuary U.S. National Workshop Steering Committee that discusses estuaries worldwide and why they are critical ecosystems in need of attention. Estuaries are one of the world’s great gathering places: for fresh water before draining into the ocean, for animal life that uses them for early development or as a migratory stopover, for commerce and transportation via the ports they host, and for people who are drawn to live or visit there. As the world’s population and emerging regional economies continue to grow, so, too, do local and global pressures that might threaten the ecological benefits of estuaries. At the same time, evolving technology, science, and resource management allow estuaries to be observed with great specificity, which enhances the ability of researchers to develop ways to address the pressures and monitor the changes. Our Global Estuary is a transformative initiative to address estuaries as critical local and global resources. In October 2013, with primary financial support from the Harbor Branch Oceanographic Institute Foundation, Inc., the Our Global Estuary U.S. National Workshop convened estuarine scientists, resource managers, coastal and ocean observing system managers, and educators, as well as experts in urban planning, Native American culture, and environmental law to discuss the state of estuary science, technology, management, and policy. The primary purpose of the workshop was to generate thinking on how knowledge produced in the study and caretaking of individual estuaries could be collected and made available to support efforts in other estuaries and for all estuaries worldwide. This August 26, 2014, report discusses why estuaries deserve more attention and provides six consensus points and three recommendations from the U.S. National Workshop. Dr. Ed Buskey is a professor at the University of Texas Marine Science Institute and Research Coordinator for the Mission-Aransas National Estuarine Research Reserve and was an integral member of the Our Global Estuary U.S. National Workshop Steering Committee.